It's not you ... It's me: Random Acts Of Facebook - Christina Aguilera Loves Adele! 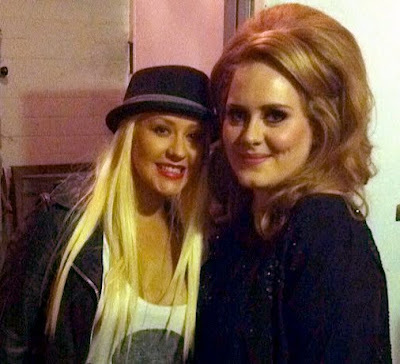 Random Acts Of Facebook - Christina Aguilera Loves Adele! Christina Aguilera hit her Facebook account last night posting a picture of herself and Adele the #1 charting artist of the year with her album "21" at her Los Angeles show at the Greek Theatre. Me & Adele after LA show. "Someone Like You" is my favorite! Beautiful to see all her fans sing it tonight! ;) love u Adele. We could only imagine the vocals these two could record together, ear drum shattering but worth it!